Not finding a store near you? 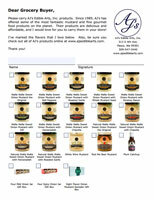 Would you like your store to carry our products? Get your store to carry our products by downloading printing out this 1 page sheet, filling it out, and bringing it to the store manager where you shop. You can also contact us, tell us where you shop, and we’ll push them to carry our products as well.